The first day of Sun's visit to Scorpio may be incredibly powerful with all that understanding of natural cycles and sensing the depth of energy they might bring. However, people born on this date need some time to collect experiences that will allow them to use their strength in constructive ways, and they could get lost several times before embracing their reality and making changes towards personal evolution. There is a tricky note to this planetary row, for while it speaks of transformation and change by its primal nature, Saturn seems to represent obstacles in one's path and family or karmic debts that are to be repaid. People born on this date seem to have two parallel lives, one in which anything is possible, and the other, limited by circumstances, systems and the collective thought. They are to realize over time that their structure and their system of support don’t depend on the outer world but on the inner one, and they become ready to make a foundation for their future moves step by step, brick by brick. Incredible connections with others will be made by these individuals, in search for the right tribe to belong to on a shared mission to evolve. "A Crowded Sightseeing Bus on a City Street"
There are too many things that are experienced for the first time in lives of those born on this date, and their social circle will easily get overcrowded and burden their ease of movement. This is a time of new experiences and these individuals see life as an adventure, curious to find out what the next moment will bring. The challenge is to set clear boundaries to others, especially in the physical world, so that their position can be as magnificent as they want it to be instead of peeking over someone's shoulder to observe and live their own life. 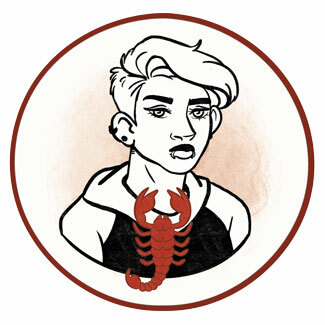 Scorpios born on October 24th are on a path of discovering personal freedom and creating enough room in their social circles to breath and express their true nature. Authentic and a bit eccentric in their inner world, they need to shine out towards others, without fear they will be judged, dismissed or tossed aside by anyone else. Self-acceptance goes hand in hand with the bravery to take responsibility for their position in the society, so they can shine brightly and spark the light in others so that everyone can evolve in their own footsteps. Time teaches them that the tribe they belong to isn’t necessarily formed on the outside but consists of their own choice of friends and close individuals that they have a deep and special bond with. 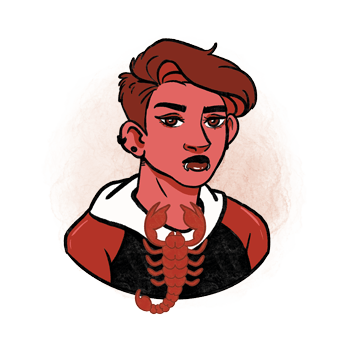 The rush of emotion when the Sun reaches the sign of Scorpio is vast and could easily make people born on October 24th obsessed with their love life and the sexual nature of their bonds. Their need to explore takes them through ups and downs that might be a bit extreme, and their romances are never boring or lacking in contact. Their emotional experiences could get a bit destructive for their heart if their boundaries aren’t clear from the start, and while they understand that they need to hold on firmly to their authentic Self, the thought slips them by when their focus turns to the partner they wish to be with in life and the afterlife. It won’t be easy for them to find a functional and fulfilling bond until they realize how to make space for themselves, setting their priority list on the way they feel before raising concerns for the other person. To not get too entangled and tied, they need to be free to live their life, socialize with their friends and have a personal foundation to fall back to if things go sour. With a sense of security found in their own world, they set free to form a relationship with someone equal, who will respect them every step of the way. A person born on October 24th excels in all kinds of exploration and digging through things that others might frown upon. They are stable in large systems and have an important role in times of crisis, working well for flight control and other stressful surroundings that require full focus. They are scientists and mathematicians, those who speak of karma, true faith, and painful experiences that need to be shared to free the world from taboos that hold the collective consciousness back. Scolecite is an excellent stone to awaken the heart of Scorpios born on October 24th and cleanse it of negative emotions. Evoking inner peace and transformation of one's beliefs, it helps them reach the point of embracing change fully and understanding their confusing role in the world. A strong stone to aid communication, especially with spiritual realms, it will support the need these individuals have to connect on a higher plane, separating their authenticity from the crowd and the collective level of emotional awareness. The nature of those born on the 24th of October may be a bit destructive, for they see pain as a natural part of life and could be difficult around those who don’t want to deal with their own wounds. If you wish to deepen your contact, get a birthday gift that shows understanding for their destructive tendencies, something to help them heal, or give them a voucher for a bioenergetic treatment or a massage. They need their body relaxed and to have enough rest, so the best thing you could do as a present is to take care of their business and take over some of their responsibilities to help them unwind. Deep, thorough, not afraid to dig into things that others find difficult or disturbing, their unexpected need for change and movement may move mountains and the entire humankind towards evolution. Distracted by emotional crisis, they might close their heart in the attempt to be fit for expectations of the outer world, forgetting that true value of Self isn’t found in contact with others but within. In 1936 Bill Wyman (William George Perks Jr.) was born, an English musician, singer and songwriter, who rose to fame as the bass guitarist for the Rolling Stones from 1962 until 1993. He is also an author, a photographer (with his works displayed in galleries around the world), and became an amateur archaeologist mostly enjoying metal detecting. He designed his signature metal detector that he has used to find ancient relics in the English countryside. In 1939 F. Murray Abraham was born, an American actor who won an Academy Award for his leading role in the movie Amadeus. As a teenager he has been a gang member and had two brothers, both of which were killed in separate car crashes. He stated that religion is now essential to his life. In 1980 Monica (Monica Denise Brown) was born, an American singer, songwriter and actress, recognized for her singles "Like This and Like That", "The Boy Is Mine", "So Gone" and others. In 2000, when she was with her boyfriend at the gravesite of his brother who had died in a car crash, he put a gun to his head and committed suicide. 1851 – Uranus’ moons Umbriel and Ariel are discovered by William Lassell (born on June 18th). 1861 – Completion of the first transcontinental telegraph line across the U. S.
1901 – The first time that someone goes over Niagara Falls in a barrel. 1926 – The last performance of Harry Houdini (born on March 24th) takes place in Detroit. 1929 – New York Stock Exchange has its "Black Thursday". 1946 – The first photograph of Earth from space is taken.